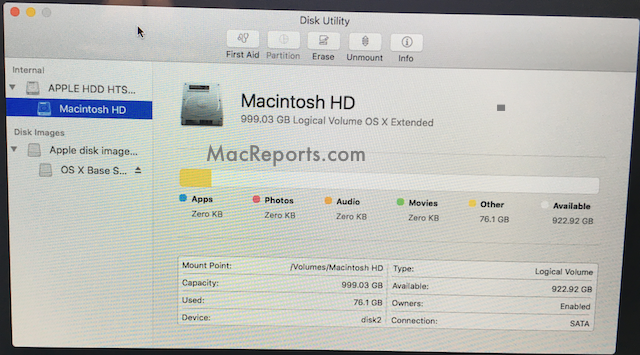 This article explains how to back up hard drive data on your Mac when OS X won’t boot. You may be having start up issues with your Mac. 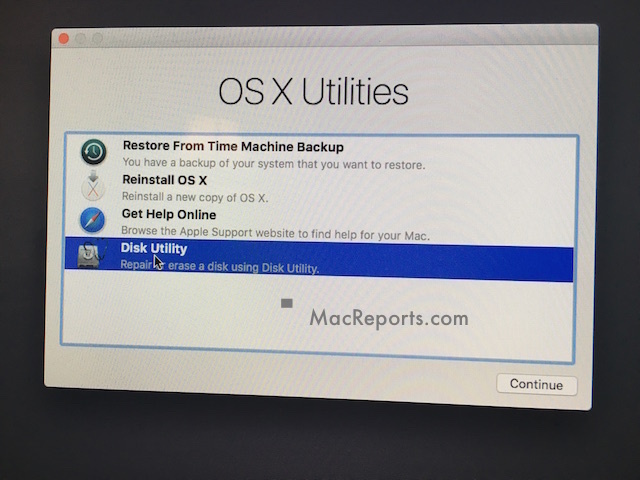 If your Mac won’t turn on, recovering your files can be challenging, but it is not impossible. Your data is valuable, thus backups are important. You should back your files regularly, so you do not lose your files. You may fix most of startup related issues. Before doing anything, however, you may want to backup your files and documents. 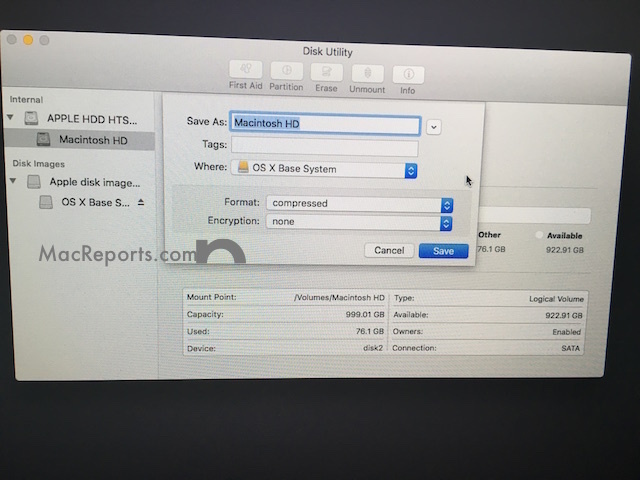 What you can do is to get a system image, which includes copies of your programs, system settings, and files, using OS X’s Disk Utility to perform the backup. This method will backup to an external hard drive. Please note that there’s no guarantee your data is recoverable. This method may not work for you. We are using OS X El Capitan. Earlier OS X versions have slightly different interface. 1-Connect your external hard drive to your Mac (yes you need an external hard disk). Make sure this drive has enough spare disk space to store your backup files. Restart your Mac and hold down the Command and R keys immediately after you hear the startup chime. Keep holding them until you see the Apple logo. 3- You will notified you when the process is done. If you get a new Mac, and want to restore your back up, you may use Migration Assistant transfer the data back to your Mac. Making backups of your files is important. Before losing anything, back up now. You may want to use the OS X Time Machine feature to easily create back up files. That is the easiest way to back up your Mac. You may also use iCloud to back up some of your files like musics, photos etc. Question: Once you have an external hard disk, how would you initialize it, if your Mac cannot reboot? The above instructions answers your question. Because your computer will not boot, you start it in Recovery Mode by pressing Command + R.
It does not answer Kendra’s question. She’s asking how, once system image is created, do you use that image to restore computer? The answer to “how do you restore from the saved image” is different, but also documented above, apparently Migration Assistant, in the newly installed OS, knows how to read those images. Hi Kendra, do you set a password for your external hard drive? Mine needs the password to unlock the drive which I am not sure how. I am trying to backup my Mac using this process for the past 1 week. Every time I reach the last step “save” , the Mac gets stuck on the screen that says “creating image”. I have kept it for hours assuming that the back up would take a long time but it never gets past that screen. Is this an issue or just it taking a long time ? Should I be more patient ? I’m with Dee, here. I have tried many things. This solution looks the most promising. Thanks for the article. But “Creating Image…” dialogue box just sits at “Copying…” and no movement on the progress bar. Any suggestions? I’m stuck on the same ‘Preparing Image’ ‘Reading Whole Disk’ with no movement on the progress bar. Is this still creating the image in question? There was no mention of using a flash drive. Use an external hard drive. Backing up my mac doesn’t seem like it’s hard to do. I’ve made the mistake of not backing up the hard drive and ended up losing a lot of file and data for my research class. It seems like now a days that doing something like this is essential. I’m having the same issue as Kendra. The Mac won’t boot–in safe mode, with the reset options, with PRAM reset, with cntl-option-cud-power– it still does the same thing. It comes, logo appears, the progress bar appears and gets hung halfway. After a bit, the screen goes to white and then it shuts down. Occasionally it will try to reboot but hangs again. Have Yosemite and keep it updated. Very frustrating to see this question not answered. That’s it chimes and logo appears. Hello Jan! I am encountering the Exact same symptoms. Did you locate/solve the problem? Have encountered this problem – it ended up being a faulty logic board. The HDD itself was fine. Problem was on a 2015 iMac and it cost AUD$900 to replace. booted perfectly, and has remained operational since December 2017. Hi, my MacBook said unable to create images. What should i do? I haven’t done any backup recently. And my MacBook just suddenly can’t boot? Same problem here. Have any luck yet? Make sure not to change the name of the back up file. That did it for me. if i back it up this way will my pictures back up too ??? i need to know as soon as possible . Looks like a great solution. Is the external harddrive where the image will be saved erased with starting backing up the image? My external harddrive is huge therefore I also have other files on it that I do not want to delete. Thanks for any feedback! Hey did you ever get the answer to your question about erasure of drive if you made an image in a drive that has information on it already? I have a few problems with my laptop. First it won’t reboot so I have tried to do the utilities screen. I am able to make it to the first steps lists above. As I select the macintosh file and try to press for the new image it won’t allow me to have a backup option. I am able to press open disk image which allows me to see all the files and folders on the laptop.under the first aid tab I have tried to verify the disk and the other one that is listed on the bottom right corner. When I am in the open disk image incan plug in my memory drive that i want to backup the laptop onto but I can’t copy the folder and move them to the memory drive. Is there any other way that i can back up my laptop when I don’t have the option where I don’t need to go to file> new image? HELP! my computer says “you do not have permission to write to the location you have selected” I am trying to copy my hard drive to the external one! i have all my files and desperately need help downloading!!!! Be sure to select your external hard drive and not the OS X Base System shown in the picture. It says to select your external drive, but it does not show that happening in the picture, which confused me at first until I started from the beginning and followed the words rather than the pictures. Hope that helps! Mine won’t boot either, so Genius Bar for me tomorrow and fingers crossed that my new TB external hard drive will save the entire image. So far, so good! Otherwise, I have lost a year since my last back up. What happens if you don’t change the OS X Base System. I think I may have forgot to change it but the image copy did not fully go through, and now my drive won’t mount in recovery mode. 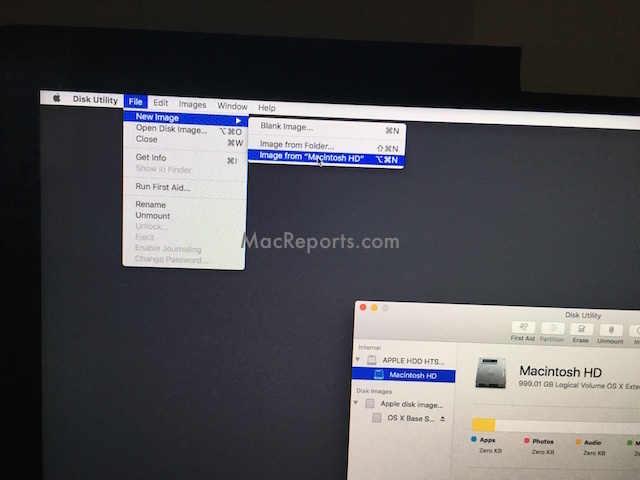 It doesn’t show my external hard drive in the “where” portion of the “File” then “New Image” then “Image from Macintosh HD”. Not sure what to do next? Wondering Elle, if you were finally able to recover your files? It’s because it is NTSF formatted. You need an external drive that is specifically Mac Ready so that it is already formatted correctly. I keep getting diskutility error 3…. any help? I’m getting the same error. Help would be much appreciated. Hello there. Coming across this as well. Has anyone found a solution? Need help ASAP! It is possible to back up if the startup disk cannot be found? I have a this situation and making a “Compressed Image” and how can i restore this image after i have reinstalled Mac OSX? Will this Image taking also backup of my pictures? Also wondering how to open this Dmg file once it’s made? Thanks. open it in mac after you recover it. thats how i recovered my files. i read in the above that if there are existing files in the external drive then those files will get erased using this solution, could someone please help reconfirm? If so, that means I need a blank/new external drive? Yes. The files from the external drive will be erased. Use a blank drive. Doesn’t it just save the disk image to the external drive? It’s a save dialogue box that pops up when I do it, where I choose a location. That doesn’t suggest an erasing of the drive. Can someone confirm this? How do I safely back up all my files without erasing my external drive or my Mac? Hey, any luck fixing error 61? I keep getting the same error in my mac. Thanks. Did you manage to back up all your files? I tried but keep h=getting the error 61. I’m stuck on that part. I am wondering why are we taking the Image from our Macintosh HD as “compressed” rather then “read/write”. In “compressed” case can i reach my files using this external harddisk mounted to another mac? I have the same question. Plus my 250gb hard drive is only shown as under a gig on the external drive. Is that because it’s compressed? wasnt able to recover the applications but all my files have been spared from being deleted into oblivion. It shows error code 3 while it is reading disk and a message saying the operation can’t be completed. Operation failed with status 2. I have a late 2009 re-furbished MacBook Pro that cant gets past the grey screen of death for more than a minute before shutting down. I believe it’s a hard drive crash. But I didn’t get a chance to back up the HD so now I’m wondering if simply replacing the HD will suffice? What to do about the OS? I set the backup going and a progress bar appeared and seemed to be working. I left it going and returned to find iMac seemingly asleep, mouse movement woke it, but to a blank dark grey screen. The external drive is showing no activity (no flashing activity light) and neither mac or external drive can be heard spinning up/writing data. Is it safe to assume the blank screen is it complete? Thanks it worked for me. To save my data from Mac, I needed to format my external harddisk (formated in a windows and Mac) to use it on Mac I needed to erase the external disk on Mac. After this It was possible to save my data from HD. Then I erase my HD Mac. i restarted the Mac, got error 61. Restarted (command +R) disk utility, install Mac Os. installed from Internet the Mac again. When trying to create a backup it keeps coming up with “Unable to create “Macintosh HD.” (Input/output error). I have re formatted the external drive I am trying to back up to so there is nothing on it. Any ideas of what I can do? Is this the same as making a Time Machine backup? In other words, when the backup is done, will I be able to restore the Mac using what was just backed up on the removable hard drive…just like restoring from a Time Machine backup? F***ing genious 😉 thank you !! Used these instructions to back up to an external hard drive. Worked just fine, except it did not backup the user library folder for mail which is the one I needed the most. Can you please show me the process. I am really battling here and petrified to loose all the stuff on the Pro. Thank you! Thank you, it also worked for me. Thanks for the advice! What should I do if my MacBook won’t turn on at all (not in recovery mode, safe mode, or anything else)? I’ve already tried a power cycle and resetting the SMC and PRAM. Thanks! After trying all the options and still getting errors (could not back up), I grabbed an empty external hard drive, booted into recovery HD, and then used the disc utility to format the hard drive as Mac Journaled drive. Next: Exit the Disk Utility, and click on Install New macOS. Install the macOS to your external hard drive and boot from it. Now you can see your original HD as a secondary drive and back up all the files you need. Operation failed: File too large. The told Macintosh size is 227 Gbs needs to back up and I have over 600Gbs left in the external drive using for back-up but its keep on happening again and again. Appreciate if someone can suggest. when i tried to do it as it described. i have a message says ” You do not have permission to write to the location you have selected ‘ even i selected an external hard drive with huge space . I’ve followed all of the steps successfully, but when I select my external hard drive and click save, I get an error message that says I don’t have permission to write to that location. Any advice? How do I unlock my WD external hard drive in Mac recovery mode if it’s lock with a password? Thanks!